Remember, OSHA states that a worker must be protected when they are exposed to a potential fall of 6 feet or more to the next lower level. They say nothing about whether that lower level is the ground, a floor, or that retention pond you are building next to. If you can fall 6 feet and hit something, you need to be protected from falling, period. The choice of fall protection system of course depends on the situation, which can vary widely, so for the sake of keeping this post somewhat shorter than a David Foster Wallace novel, let’s stick with the aforementioned trench box example, shall we? When you excavate a trench, wouldn’t it be nice to have an anchor or guardrail system in place to keep your valuable workers from falling and becoming yet another victim of the all-too-common workplace fall? I wonder what you could do? Hmmm…what if there were a way to attach a guardrail or anchor directly to the top of your trench box? Well, you’ve come to the right place, my friend. 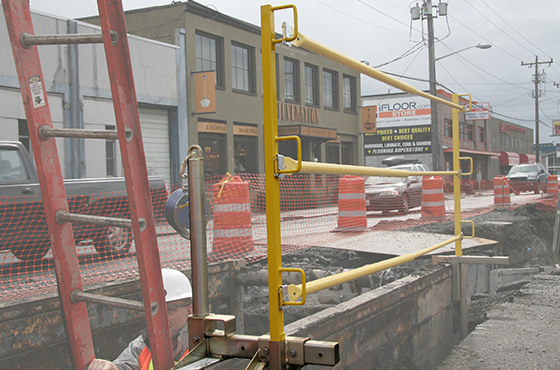 Allow me to introduce the Guardian-designed Trench Box Anchor and Guardrail system. The Trench Box Anchor attaches to trench box walls up to 10” thick, provides a fully OSHA and ANSI compliant 5,000lb. anchor point, and is compatible with SRLs and shock absorbing lanyards (be sure to calculate your fall clearance for proper equipment selection). Having the ability to tie off near an excavation gives the worker much-needed peace of mind and ensures ingress and egress via ladders is as safe as possible. In addition to the anchor, the Trench Box Anchor also has a receptacle for a standard Guardian Guardrail Post. If you would prefer to have a guardrail only and do not need an anchor, consider few Guardian-designed Trench Box Guardrail Receivers and Snap-On metal rails or 2x4s to complete the installation. For construction sites in the midst of public activity (think street work), adding guardrails to your trench box makes a lot of sense to help prevent injuries to texting pedestrians who might be more interested their phone than watching out for hazards. Seriously, pedestrian fatalities are up sharply, and cellphones might be partially to blame. So, the next time you show up to a jobsite and start working on your fall protection plan, be sure to think about all of the potential fall hazards, not only the ones high up in the air, but also the ones right under your feet. Sometimes the things closest to us are the hardest to see, fall hazards included. Be safe up there, AND down here.